That’s three of my top 10 most visited website pages. 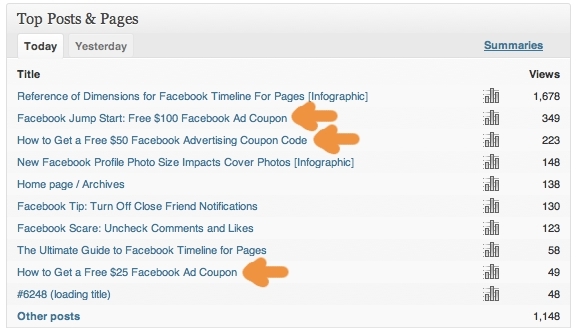 Each one a blog post related to getting a Facebook advertising coupon. What’s the problem, you ask? Well, each blog post refers to an offer that is no longer available. Popular, but irrelevant. That’s 621 of my 4,000+ page views (15%) in a day going to pages that provide users no value whatsoever. People were going to these pages from search engines, undoubtedly disappointed in what they found. Immediate exit. Completely wasted traffic. The Result: More than 30 people in two days have subscribed to this new email list. This is not the first time that I’ve observed hollow, wasted traffic numbers on my site. It’s a sneaky thing. It’s nice seeing numbers, but when a high percentage of your traffic is going to irrelevant pages, you know that the numbers are misleading. In the past, I’ve just shrugged my shoulders and let it go. That was a mistake. There was an opportunity to be had. These people were coming to my site in search of answers. In almost every case, readers who landed on these old blog posts were referred by search engines. They want to know how they could get Facebook ad coupon codes. They were perfect prospects for me. But I just couldn’t provide what they wanted. Knowing this, I gave them the next best thing. I created a list on AWeber for Facebook Ad Alerts, allowing these readers the ability to subscribe to a notification when future coupon codes become available (and “other” Facebook marketing tips). The Lesson: Watch your traffic numbers and find opportunities where you can funnel your readers to a conversion. How have you creatively handled situations where your traffic is being dominated by referrals to old, irrelevant blog posts? Share your experiences below!